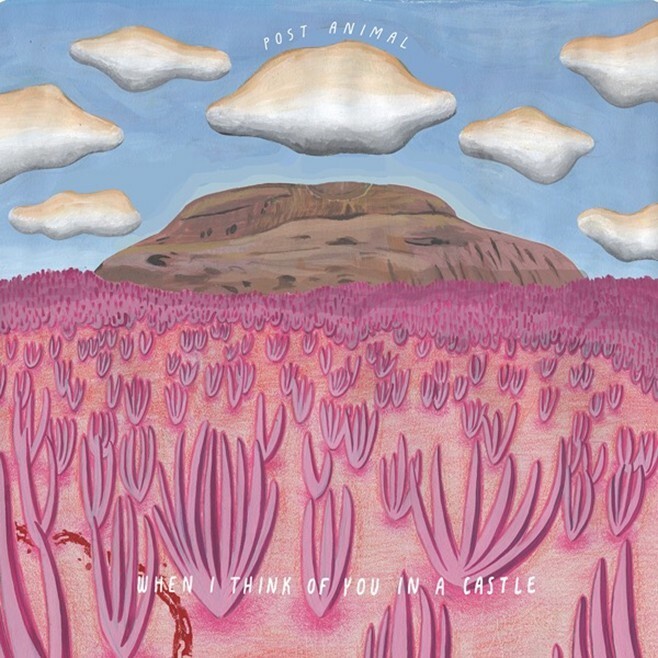 If Post Animal‘s When I Think Of You In A Castle had a theme, it would be chaos. The songs constantly shift through motifs and subgenres, but in the best possible way. There are six* musicians throwing their hats into the ring and their collaboration takes on so many amalgamations it’s hard to keep the train on track. The album covers everything from psych and ambient to a touch of southern rock on “Susie“. This first project via Polyvinyl is a fusion of madmen’s genius that is sure to please all the kiddies no matter what genre they claim to worship. A perfect example of what I’m talking about are songs like “Gelatin Mode” which begins with heart attack inducing drums transitioning to an explosion of duelling guitars. Then, Toledo’s drums switch it up to create a sway worthy rhythm. From there the band goes into a full psychotic frenzy just to drop it back down to a slower tempo during the versus. Then, smack in the middle we’re propelled into a spacey, Tame Impala-esque void which, almost too quickly, we’re ripped back out of. This song reminds me of a long, exciting water slide. And that’s only track two! “Victory Lap/ Danger Zone” and “Dirtpicker” are two other examples of the fantastical musical whiplash that Post Animal take us on. “Victory Lap/ Danger Zone” is a perfect example where at first we’re taken down a heavy, heavy psyche road that builds until the boys are sonically bashing our ears drums with baseball bats and then it turns into a palatial, airy ballad. DEAR GOD THE SHEAR duality of this album is enough to lure in any unsuspecting human! Tracks like “Tire Eyes” and “Ralphie” lend themselves to a retro air. This is definitely where the band is busting their pop song chaps. Here we are reminded of bands like Boston, Thin Lizzy, and Foghat. When I Think Of You In A Castle was a long time coming for the band. Almost two years ago the entire band, including Joe keery who is no longer a touring member but still contributing to the ensemble, stayed at a lake house where they recorded the majority of the album. It wasn’t until much later when they were signed to Polyvinyl that this project would become a reality. Dalton Allison did the final mixing of the piece and Hirshfield’s brother Jared mastered it. I interviewed them back in the fall of 2016 when they had just made the trek to PAW PAW lake in Michigan to record this album. The album was supposedly, suppose to be called The Gators Are Back in 3D, but it seems that idea was thrown out. The band also share with me a few creepy stories of an old man who haunts the lake house where they recorded so it’s no surprise there are off supernatural vibes on the album. Post Animal are currently headlining a grueling 48 city tour. As someone who has seen the band multiple times in different types of atmospheres and venues I can say that every show is a heart punching, enthralling ride that ends far too soon. Be sure to see them and pick their album up via Polyvinyl on 4/20! * Dalton Allison: guitar, vocals, Jake Hirshland: keys, bass, vocals, Matt Williams: guitar, vocals, Joe Keery: guitar, vocals, Javier Reyes: guitar, Wesley Toledo: drums, vocals.